It’s that time of year again! The NZGDA’s Annual General Meeting will be held at to 6pm on 11 September 2018 at Victoria University School of Design (139 Vivian St. – Wellington). NZGDA Board Candidates for 2018/2019! Voting begins August 22nd! Find out more about this year’s candidates for the NZGDA board and participate in our online ballot. Are you a community minded game developer who wants to grow New Zealand’s game development sector? Then consider standing for the New Zealand Game Developers Association 2018 Board! 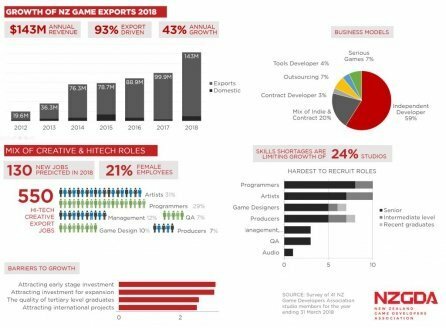 New Zealand’s game developers earned a record $143.0M in the financial year ending 31 March 2018 according to an independent survey of New Zealand Game Developers Association studios. Kiwi Game Starter 2018 Finalists Announced! 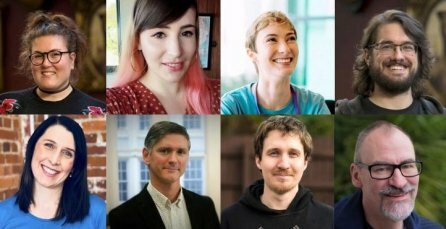 Four finalists have been chosen to present to the judging panel before the NZ Game Developers Conference at the SkyCity Convention Centre on Wednesday, 1st August 2018. NZGDC18 is proud to announce the first We’re in Games Social (WinGS) event for women, non-binary and LGBTQIA+ game developers! This is an opportunity to help up-and-coming game developers create connections and support networks to grow their business and advance their careers. Final Keynote Speaker For #NZGDC18 Announced! A self-titled design dilettante, Caitlin Goodale is our final NZGDC18 keynote speaker! Having worked on everything from Hololens at Microsoft to Minecraft’s console editions, she is passionate about accessibility and making games everyone loves to play. Call for Speakers & Workshops: #NZGDC18 – Deadline Extended! We’re happy to announce that the deadline for NZGDC18 Call for Speakers and Workshops is being extended by one week, to Monday 25th June at 9pm (NZ time, UTC+12:00). Tickets for #NZGDC18 Available Now! 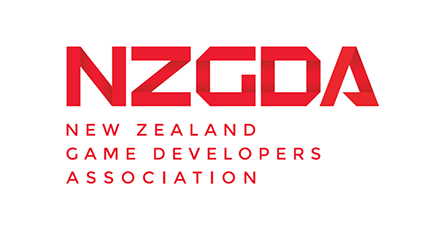 The NZGDA is pleased to announce that tickets for the New Zealand Game Developers Conference 2018 are available now. First Keynote Speaker For #NZGDC18 Announced! Harry is the lead artist and programmer from Team Alto, a collaboration with Toronto-based studio, Snowman. He is best known for the critically acclaimed Alto’s Adventure and recent Apple Design Award winner, Alto’s Odyssey. The NZGDA is proud to announce the New Zealand Game Developers Conference 2018 – an action-packed three day conference for professional and indie game developers in New Zealand’s fastest growing creative sector. Entries for the New Zealand Game Developers Association startup programme for interactive games businesses, the Kiwi Game Starter, are now open!